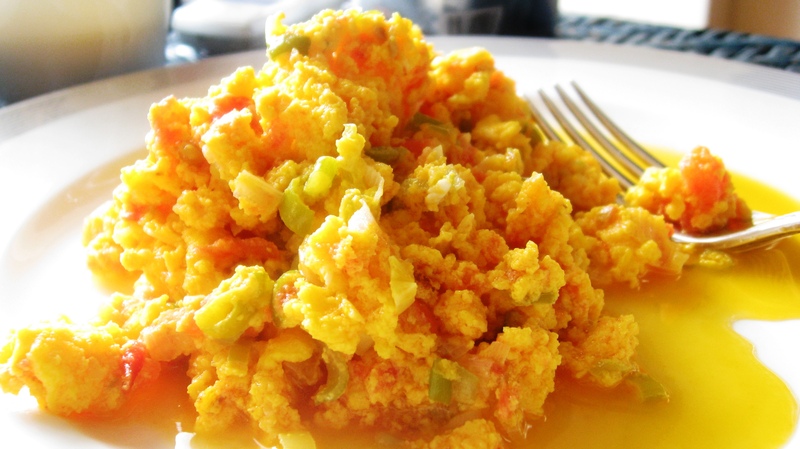 You are looking at an amazing dish of scrambled eggs, Colombian style. This picture was taken in Colombia at Henry’s parents’ house. Anita, their maid, taught me how to make these and they are truly delicious, wet, tasty and totally satisfying. We will be sharing a couple more incredible experiences with you over the next couple of weeks. We are happy to be home and we thank you all for your continued viewing and commentary. Happy New Year to you all! Heat a skillet (non-stick if you have it ) with butter or coconut oil over medium heat. Add peeled tomatoes and scallions and cook about 5 – 7 minutes until 1/2 cooked. Pour the eggs in the skillet with the tomato mixture and cook over medium heat, without stirring, until mixture begins to set; then fold eggs over to ensure that they do not burn. …continue to misx until the eggs mix with the tomato and scallions and cook about 2 minutes or until the eggs are the consistency you like. This looks like a lovely change to my usual range of Paleo breakfasts – looking forward to trying it! I just found your blog, and I wanted to say thank you. I have recently started the Paleo lifestyle and its been amazing how much better I feel. I wish I would have always eaten like this. Can not wait to try some recipes! THANK YOU! !